Are you looking for a fun way for your students to learn more about text structure? 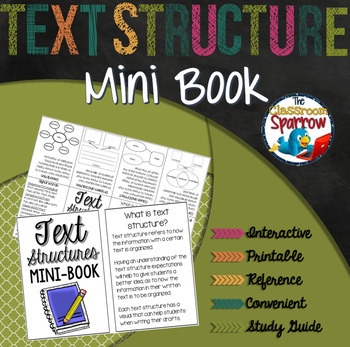 Not only is this book an interactive way for students to learn more about text structure, it's also a convenient writing reference that easily stores in a desk, binder pocket, or pencil case (once folded, the book is approximately 3.5 x 2 ¼ inches). Step-by-step folding instructions with pictures are included. For a complete list of all of my English Language Arts mini-books, click HERE. • What is text structure? *Also, included are half-page copies of the mini-book for students who may require a larger, more legible font (the pages can be stapled to form a larger book). WAIT! Like this product, but want an even better value? If you purchase the English Language Arts Mini Book Bundle, you will receive any future mini books posted for FREE! All you have to do is re-download the file to get access to any new additions! Check out the FREE preview for a better look at this item!